into the Oven; bake them in a quick Oven. Rasp them. 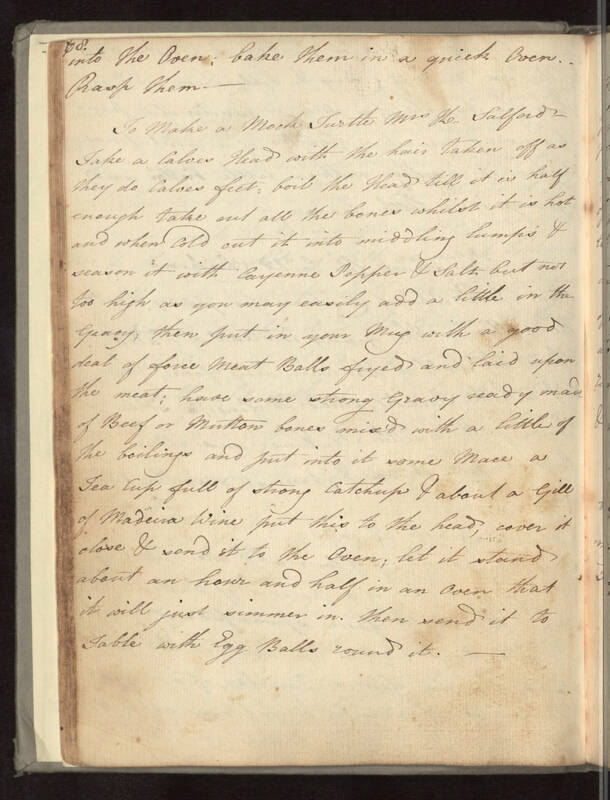 To Make a Mock Turtle Mrs H. Salford Take a Calves Head with the hair taken off as they do Calves feet; boil the Head till it is half enough take out all the bones whilst it is hot and when cold cut it into middling lumps & season it with Cayenne Pepper & Salt but not too high as you may easily add a little in the Gravy; then put in your Mug with a good deal of force Meat Balls fryed and laid upon the meat; have some strong Gravy ready made of Beef or Mutton bones mix'd with a little of the boilings and put into it some Mace a Tea Cup full of strong Catchup & about a Gill of Madeira Wine put this to the head, cover it close & send it to the Oven; let it stand about an hour and half in an Oven that it will just simmer in. then send it to Table with Egg Balls round it.